Historian Karen L. Leedom has written a book long past its due. "Astoria: An Oregon History" tackles a daunting task by forming a framework for this aged city's story. The nearly chronological glimpse into Astoria's history is presented topic by topic in a quick, pleasant style. The writing is clear, sources are good and Leedom does an excellent job of digesting volumes of information. It is a textbook-like account, not a narrative, and contains little editorial comment through its 200-plus pages. Some readers may quibble that Leedom has refrained from describing the flesh and blood of Astoria's pageant. But to adequately describe Astoria's eccentric, indomitable citizens, Leedom's book would stretch to encyclopedic lengths. Leedom knows her target audience and has crafted a guidebook that will fit nicely into a purse or backpack. The book will be popular with tourists and locals interested in a quick recitation of facts. The text touches upon events that should be part of everyone's basic vocabulary. There is a discussion of early exploration and initial contact between Europeans and the Chinookan people. Of course, the fur trade and pioneer period is covered. Description of early industries and the development of Astoria fill the pages. Make no mistake, Leedom is not the first to cover these topics in a publication. Five years ago, for instance, Bryan Penttila authored the book, "Columbia River: The Astoria Odyssey." His writing evokes his love for the area. It is clear the lower Columbia River's history is a part of his soul. Photographs, largely mined from the archives of The Compleat Photographer, are exquisite. Penttila covers much of the same story found in the first half of Leedom's book. But here is where Leedom separates her book from others: The past is directly related to the present. Furthermore, the milestones of our recent history are noted. For longtime Astorians, the whole story might seem obvious. Leedom, however, is relatively new to Astoria and approaches the story with a fresh, inquisitive perspective. She answers a basic question not readily discernible to those arriving in our city, "What are we looking at and how does is it relate to Astoria's history?" Many will appreciate her discussion on navigating the river and the complexities of operating bar pilot and river pilot services. Can't remember how ship captains use their horns to signal river pilots, bar pilots or launches? Leedom includes a quick reference highlighted in a box. Ever wonder what happened to the native people who once flourished in our region? Leedom includes a segment titled "Where Are They Now?" a wonderful synopsis of the Chinookan peoples' struggle for survival and federal recognition. Leedom offers three self-guided tours of the Astoria area. One tour encompasses Fort Stevens to Fort Columbia and Youngs River Falls to Knappton Cove. A second tour focuses on the Astoria waterfront while a third tour explores Astoria's downtown. While not as in-depth as the walking tours written by local historians Vera Gault or Bruce Berney, tourists on a fast track will leave the area with their appetites whetted. Perhaps most useful, Leedom has compiled a chronology of events spanning from the 1500s to 2007. For locals who can't keep dates straight, this 10-page section will provide much relief. When did Capt. Bruno de Heceta first sight the mouth of the Columbia River? 1775. When did John Shively open the first post office west of the Rockies? 1847. When did Ed Parsons develop cable television? 1948. For tourists, this section nails the breadth and depth of our area's historical significance. One cannot skim this chronology without recognizing Astoria's eminence in our nation's history. Leedom's finely crafted book deserves a look. It is written with an accessible style. And its clear recitation of facts can be used as a starting point for anyone wishing to explore Astoria's rich legacy. Astoria resident Karen L. Leedom presents Astoria: An Oregon History, an extensively researched, informed and informative local history of the city of Astoria, Oregon - the oldest European-American settlement west of the Rockies - illustrated with black-and-white photographs and featuring three self-guided tours. Chapters tell of Astoria's colorful past dating all the way back to the 1500s. 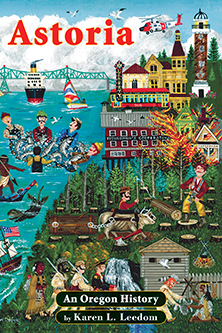 From Native American life to the rise of logging and fishing to Oregon's first female surgeon and dramatic Coast Guard rescues, Astoria: An Oregon History is as fun to read as it is educational. Highly recommended for anyone traveling to Astoria, whether for business, pleasure, or a family visit!